A Russian man died in a bizarre accident when a huge inflatable ball he was travelling in fell of the side off a mountain. 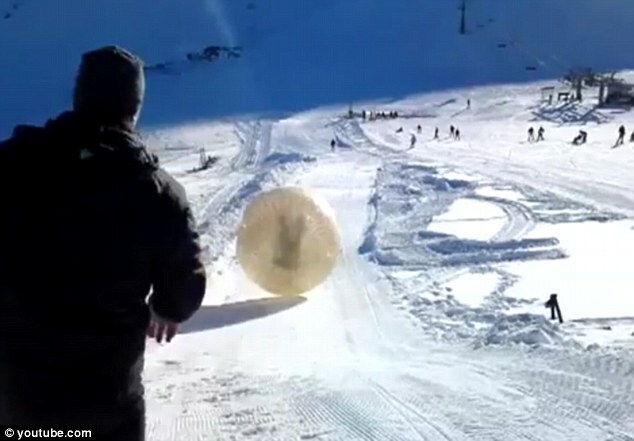 The freak “zorbing” accident happened at a Russian ski resort. 27 year old Dennis Bukaraov and Vladimir Shcherbov, 33 climbed into the “zorb’ a huge inflatable plastic ball att the top of a gentle ski piste at the Dombai resort complex in Russia’s North Caucasus mountains. A man at the bottom was meant to catch him as he rolled down the mountain , but the ball spun away from its intended path and crashed through rocks before falling into a ravine. ‘The orb went on for about one and a half kilometres, jumping on the rocks and hitting them,’ said a policeman. The zorb finally came to stop on a frozen lake.When rescuers finally reached them, both men were still alive but sadly Mr Bukarov died on the way to hospital. Amazingly, his companion Mr Shcherbov survived with only multiple cuts to his body and severe concussion. Incredibly the whole horrifying incident, which happened earlier this month, was captured on camera. Police have launched an investigation into the accident and the extreme sports organisers could be prosecuted for criminal negligence causing death.